What is the abbreviation for District Agricultural and Livestock Development Officer? A: What does DALDO stand for? 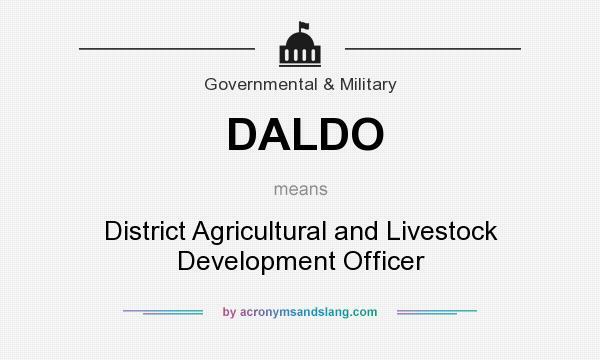 DALDO stands for "District Agricultural and Livestock Development Officer". A: How to abbreviate "District Agricultural and Livestock Development Officer"? "District Agricultural and Livestock Development Officer" can be abbreviated as DALDO. A: What is the meaning of DALDO abbreviation? The meaning of DALDO abbreviation is "District Agricultural and Livestock Development Officer". A: What is DALDO abbreviation? One of the definitions of DALDO is "District Agricultural and Livestock Development Officer". A: What does DALDO mean? DALDO as abbreviation means "District Agricultural and Livestock Development Officer". A: What is shorthand of District Agricultural and Livestock Development Officer? The most common shorthand of "District Agricultural and Livestock Development Officer" is DALDO. ARDCI - Agricultural and Rural Development for Catanduanes Inc.